Introduction: Daiwa updates their Fuego spinning reel with an entirely new design that not only features modernized styling but a new base material. 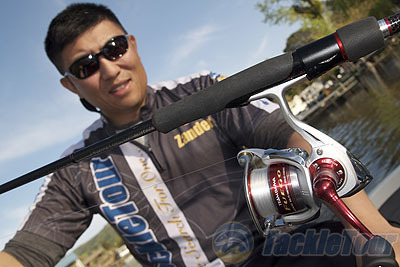 While the previous generation Fuego made use of a magnesium frame the new reel now is constructed from Zaion, Daiwa�s own super-carbon material, which first debuted on the Zillion rod seats. 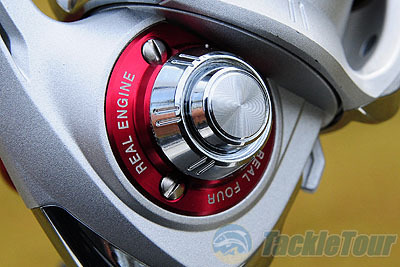 Is this new reel all �sizzle� or does the Fuego-A �fizzle� out in comparison to other competing reels? Let�s find out. 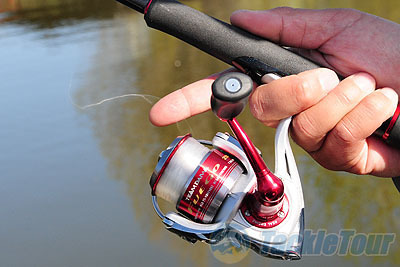 Impressions: Both Shimano and Daiwa went in a similar direction with the introduction of their spinning reels that once made use of magnesium (Stradic Mg and Fuego) and now utilize advanced carbon composites. While some of us would speculate that the new materials actually make it cheaper to manufacture these reels there is no denying certain advantages of using these new fangled composites. Unlike magnesium these carbon based reels are corrosion resistant and are designed to deliver a better strength to weight ratio. Each Fuego-A comes loaded with seven bearings (4CRBB, 2BB, 1RB), this is one CRBB bearing up from the previous generation. 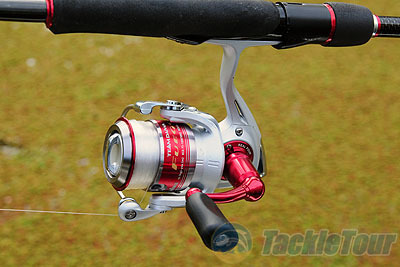 All but the smallest 1000 size comes with a 4.8:1 gear ratio, the smallest size has a ratio of 4.7:1 and every reel comes with an identical aluminum spare spool which is a very nice plus for a high end reel, these days it seems like only the midrange reels come with an identical spare spool while the value reels still come with down-spec spools and the high end reels come with none. When it comes to styling the new Fuego-A is definitely toned down from the previous generation which entirely painted red, there was simply no mistaking that the previous reel wanted to convey the message of �fire,� and in comparison the new version has a much more subdued look. 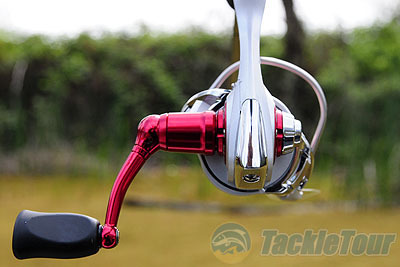 The new reel�s frame is now matte grey and there are anodized red styling cues found on the handle and spool which tie the reel in with its moniker. The Fuego-A is more clean and utilitarian looking and will likely appeal to a wider audience as it can be more easily paired with a greater variety of rods. Real World Test: To test the Daiwa Fuego-A I paired the reel with the same Steez spinning rod that I tested the previous Fuego reel on and mainly focused on finesse applications like drop shot, shaky head and split shot with lighter 4 to 6lb lines. I targeted fish in both the clear water of Lake Pardee and the bass paradise that is Clear Lake. Casting: The Fuego-A is capable of casting even the smallest and lightest lures when paired with 4 and 6lb. test lines. The ABS machined spool does a fine job holding line and letting it out in large consistent loops. 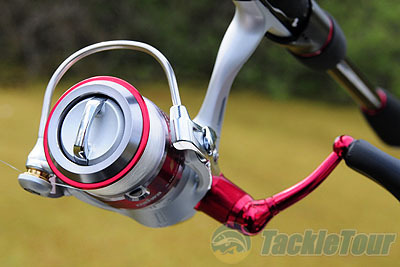 The bail system on the new reel is a monumental upgrade from the outdated external bail trip mechanism found on the previous version. The previous version�s bail trip mechanism was actually built into the side of the rotor where a lever would extend when the bail is open and flip closed when it came in contact with the reel�s arm during rotation.